Minibeasts, Ladybirds and Sun Catchers! Pippins class have been learning about minibeasts this week and have been making some buzzy bees with black stripes and silver wings. 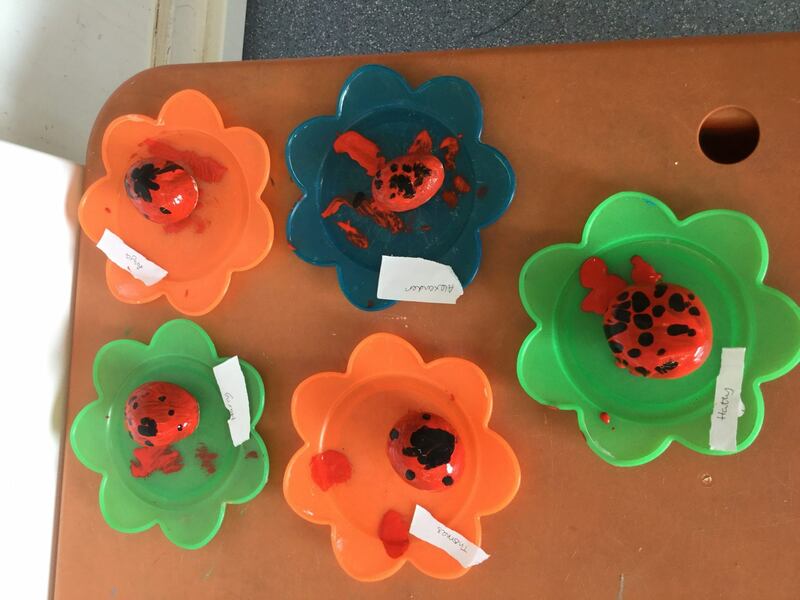 We painted pebbles red and used fingerprints to make some ladybird paperweights and then made some scary handprint spiders. We have enjoyed welcoming Thomas to our class this week, he seems to be settling in beautifully. This week in Acorns we have been reading ‘What the Ladybird Heard’ and have used paper plates to make lovely ladybirds. We went on a lovely mini beast hunt during Forest School and then collected natural materials to collage mini beast pictures. We especially liked listening and looking at the geese and chickens in the field next the school, listening to the different noises they made. We do hope that all the Oaks mothers enjoyed their card and tea bag! We were very proud of all the children who were so well behaved in the service and sang beautifully. This week the children have been listening to the story of The Gingerbread Man, making colourful sun-catchers and of course edible ones which we enjoyed eating in the woods after they had run away!